The Civil Administration is preparing to demolish monument to IDF soldiers despite legal and political efforts to stave off destruction. According to various reports the Civil Administration intends to move forward the destruction of the monument erected in the Netiv Avot neighborhood of Elazar in memory of slain IDF soldiers Lieutenant Colonel Immanuel Moreno and First Lieutenant Ezra Asher. The soldiers were killed during the Second Lebanon war. Moreno's task was so sensitive that to this day his picture cannot be viewed by the public as it might put others in danger. 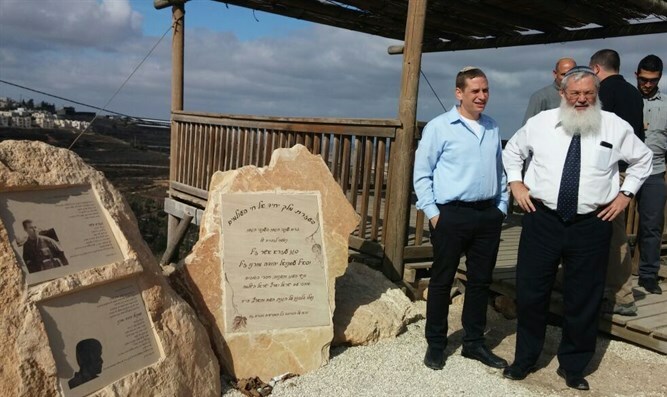 Arutz Sheva spoke with the acting head of the Gush Etzion regional council, Moshe Saville. Saville initially confirmed reports about the intended razing of the monuments in the next few days. "We have heard about the Civil Administration's intention to expedite the destruction of the monument despite the fact that we are conducting significant negotiations to prevent its destruction. We do not want to see monuments to IDF soldiers being destroyed. We think it is wrong. This is not a structure which is harming anyone and nobody is claiming the land on which the monument was erected." "We are doing all we can and trying every avenue to prevent this from happening. At the same time we wish to emphasize that this will not pass silently. Neither the families of the soldiers nor the residents and those who erected the monument will let the matter pass without a response." Regarding the intensive efforts to prevent the destruction, Saville said: "There is a High Court decision requiring the government to do this before the end of the year. For some reason there are those who want to speed up the destruction, and we are hearing hints to that effect. We know that last week they intended to act but we managed to put on pressure and postpone it. We told the Civil Administration to wait until we have utilized all the available legal procedures." "I don't know whether we will stop it but we will do all in our power to stop it. It is absurd to destroy a monument situated on land the government intends to regulate and on which there is no claimant, but there are still officials intent on destroying it and performing an injustice to the dead soldiers' memory. It is our right and our obligation to protest this act." A few days ago Deputy Defense Minister Eli Ben-Dahan visited the monument and the adjacent Netiv Avot neighborhood together with Saville, who mentioned that he himself spoke with Ben-Dahan to try and use his influence to prevent this injustice from happening. Saville added that "This requires time. Even though he wants to help and realizes how ridiculous this is, these actions require time and (the Civil Administration) should not be so eager to act with such urgency." Regarding the predicted protests against the destruction of the monument Saville said that "We are negotiating with the leadership of Netiv Avot and Elazar. I feel that there is a real moral requirement not just on the residents of the area but on all Israeli citizens to say that such an injustice cannot be done. It is illogical and immoral, I expect people to come and visit in order to see what we are discussing and when they realize that this is irrational they will change their attitude and do all in their power to prevent this destruction." The Coordinator of Activities in Judea and Samaria, Yoav Mordechai, told Arutz Sheva a number of weeks ago that "In response to a petition requiring the state to evacuate all the structures in the Netiv Avot outpost, a ruling was issued requiring the evacuation of a pergola and monument which are not on state land. If these structures will not be evacuated independently the authorities are required to remove them in accordance with the time frame established in the ruling."